Raymond van Barneveld sits just one point outside the top four after five matches played. Last week he was 5-3 down against Gerwyn Price and facing his third consecutive defeat when he managed to win four legs in a row courtesy of some impressive finishing with checkouts of 121, 80, 101 and 89 giving Barney a 7-5 win. Before the late surge of excellence, his performance against Price was poor; highlighted by the fact he was averaging just 86 after seven legs of the match. He did lift his match average to 91.65 by the end of the match but that is still disappointing by his standards. His scoring in this season’s Premier League has been well below-par. Barney has averaged just under 94 with his first-nine darts over the last two matches and his tournament first-nine dart average is the second lowest of all players in the league. Gary Anderson has won just one of his five matches in the 2018 Premier League. Last week he came back from 6-4 down and had to survive missed match darts from Gurney before salvaging a 6-6 draw. It was the second match in a row where Anderson snatched a point after his opponent missed a chance to seal victory. Although he hasn’t been winning Premier League games, his performances have been of a good standard. This is shown by the stat that he has averaged just over 103 across his last four Premier League matches. Last weekend, Anderson backed up his recent UK Open triumph by winning 14 consecutive matches to claim two Players Championship tournament wins. On his way to winning the Saturday tournament he had 6-0 wins over both Rob Cross and Peter Wright. Overall, he is unbeaten in his last 22 matches in all competitions (W20 D2). Night six of the 2018 Premier League concludes with a battle of two darting heavyweights who have experience of going all the way and winning this tournament. Neither player is currently in the top four though and will have plenty to do over the next few weeks if they are to establish themselves in the play-off positions. Although Raymond van Barneveld is ahead of Gary Anderson in the league table it is Anderson who has played to a higher standard, and the Flying Scotsman certainly comes into this fixture with a lot more confidence than his opponent courtesy of three tournament wins within the last two weeks. 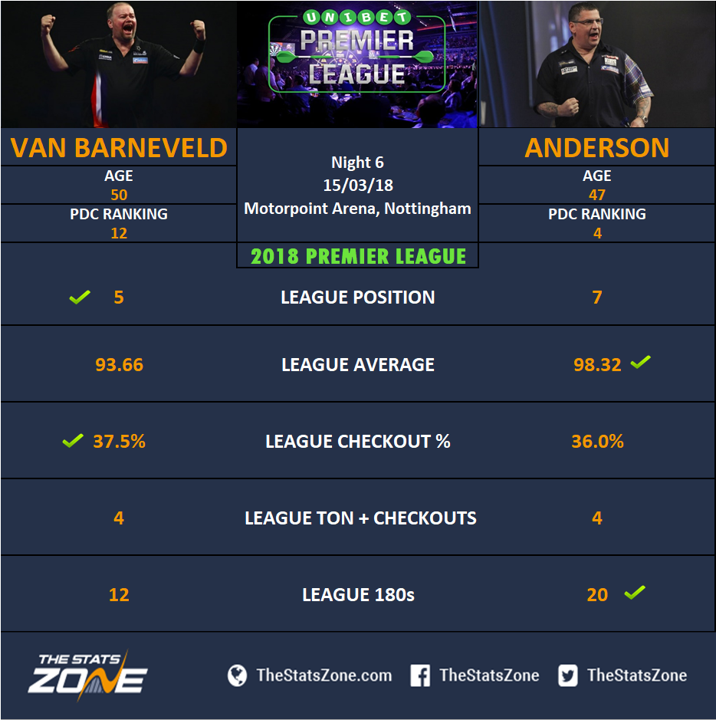 It is difficult to completely write Barney off, as if he turns on the style he still has the game to beat the very best, but he has been well below his best for much of this Premier League campaign and an in-form Gary Anderson looks likely to come out on top in this match.